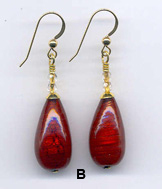 Venetian Beads: Solid Red and Gold foil Venetian glass bead earrings. 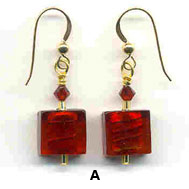 Red, Venetian Bead earrings, with 24 Karat Gold Foil Inside. Your choice of Squares or Teardrops.